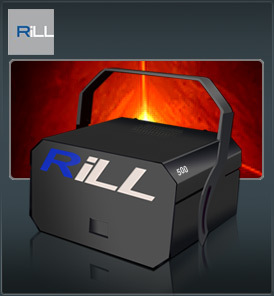 The RiLL Ruby 500 is the most eye-catching laser you’ll see at any event, This truly rare gem of a laser is special due to its bright wavelength of highly visible 635nm red laser light. Most other laser systems on the market use dark red lasers and are too dim to be used on there own, The RiLL Ruby 500 is different and like no other, at the front pack its leading the way with its truly vivid red laser beams. The Rill Ruby 500 for those that want to be different.